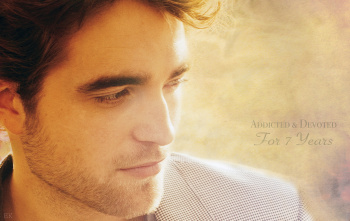 Today we're celebrating 7 years of ROBsessed. They say time flies when you're having fun and that's never more true when you're talking about ROBsessed. We want to say a big thank you to YOU, our readers. You make this blog what it is. Thank you so much for coming back multiple times a day to check what Rob is up to, to check what other ROBsessors are up to, and to see what the crazy bloggers posted this time. Without you we would just be 5 lunatics laughing at our inner thoughts. We hope we bring a smile to your faces everyday. This blog is our happy place and we hope it's yours as well. Thanks to the man himself, Rob. For being the talented, witty, big hearted, gorgeous guy that he is. And for being the special guy who brought us all together. A lot of great friendships have been formed over the years and it's all because of our mutual love for Rob. We'll be here every step of the way and hope you'll be here to join us! Click to Download Full Size Wallpaper and a version without the writing. Ok onto our Birthday Giveaway. Below you'll find all the answers you should have come up with for our 9 questions! Did you get them all right? Who infamously got Rob to talk about his hair on Jay Leno, leading to years of speculation that Rob doesn't wash his hair? How was Rob immortalized in 2011? What did Rob say about ROBsessed? Name the biggest thing that happened for Rob professionally in 2013? Besides his list of auteur directors Rob grew something else in 2014. We want to know, what did Rob grow? GOG wins A Rob film DVD or Bluray of your choice, An unofficial 2016 Rob calendar Novel from the Robert Pattinson Book Club or our ROBsessed Friday book giveaways, A ROBsessed button & A ROBsessed fridge magnet. We will email each of you soon to get your mailing details!